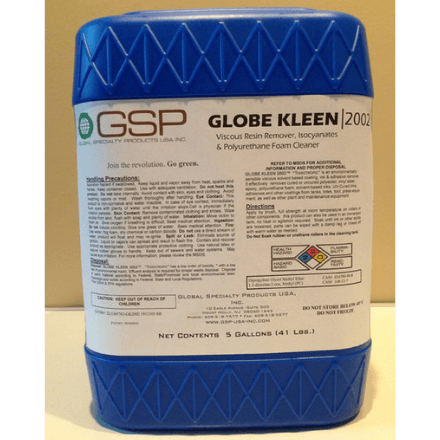 GLOBE KLEEN | 2002 ™ is a mixture of organic solvents, wetting agents and a corrosion inhibitor designed to replace Chlorinated Solvents, Acetone, MEK, Methylene Chloride and Caustic Based Cleaners. Due to its low vapor pressure and high boiling point It evaporates 237 times slower than Acetone and MEK and 600 times slower than Methylene Chloride. This means, whatever quantity you purchase, you will use. Compatible and non corrosive on various substrates such as; metal, plastic and glass. It easily adheres to vertical and horizontal substrates and effectively removes cured urethane foam deposits and build-up from mixing heads, troughs, conveyor parts, side walls, floors, rollers, foam cutting devices and molds as well as other plant and maintenance equipment; no heating required, no residues following cleaning process. All GLOBE KLEEN 2002 documentation, manuals and resources available HERE.